We save lives. We find long-term solutions to poverty. We support women and girls to overcome inequality and fulfil their potential. We have over 70 years’ experience of fighting poverty in the world’s most vulnerable places. 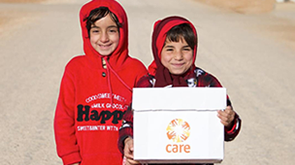 Did you know that CARE was originally set up to send CARE packages to people in Europe recovering from World War 2? Find out what we aim to achieve by 2020 – and how we’re going to do it. We work in 79 poor and developing countries, helping millions of people every year. Read more about our priorities, our progress and our achievements. We’re committed to being open and accountable about what we do. Our funders and supporters – people like you – make our work possible. Find out more about how we fundraise from supporters like you. For every £1 raised, we spend 85p on delivering lasting change in people’s lives. We’re passionate about fighting poverty, defending dignity, and delivering lasting change. Thank you for all your wonderful help – we couldn’t do it without you. We're committed to protecting the people we work with from sexual abuse and exploitation.